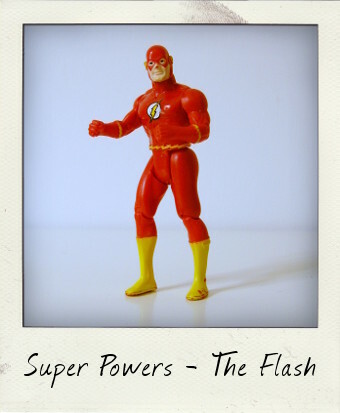 Kenner Super Powers: The Flash! Whilst the focus of my own personal collection of vintage action figures tends to be on movie and TV memorabilia sometimes I just can't resist adding the occasional superhero to the stash, particularly when the figure is a real classic like this version of The Flash. Created by Kenner in the first wave of their Super Powers line in 1984, this 4 ½ inch figure really was a superb rendition of The Scarlet Speedster and like the other figures in the line had his very own Super Power – Power Action Lightning Legs. If you squeeze his arms together his legs will make a running motion, although if you want to avoid him goose stepping it's better to bend his knees very slightly! Kenner's Super Powers featuring superheroes from DC Comics, together with Mattel's Marvel characters in the rival Secret Wars toy line, helped fill the yawning gap in the action figure market in the early 1980s left by Mego's World's Greatest Superhero line. Sadly, the Kenner Super Powers line was short lived and production stopped in 1986 after the third series of figures was released. Imitation may be the highest form of flattery, but when Toy Biz released its DC Super Heroes line in 1989 they proved to be vastly inferior figures – they even used a slightly remodelled version of this Super Powers Flash action figure but with a different head sculpt and recycled it as the Riddler. The Kenner Super Powers line has proven to be enduringly popular with collectors, however, and it isn't hard to see why once you actually hold one in your hands. The idea of hiding the gimmick and avoid the use of visible levers etc. was a stroke of genius – the beautifully sculpted figure remains intact with no ugly switches – and the attention to detail in the mold is stunning for such a small scale figure. I love the detailed back muscles on this Flash and check out the soles of his feet that even have the treads on his boots for gripping the pavement when he gets those Lightning Legs running really fast! 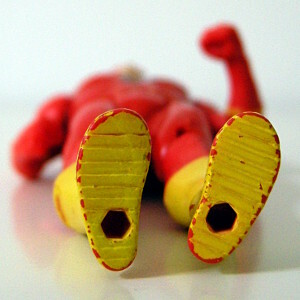 My Flash figure is still in pretty good shape – he has a little paint wear, unfortunately rather conspicuously on the tip of his nose and he has scuffed his boots a little with all that running – but nevertheless is a great find and an instant favourite figure!